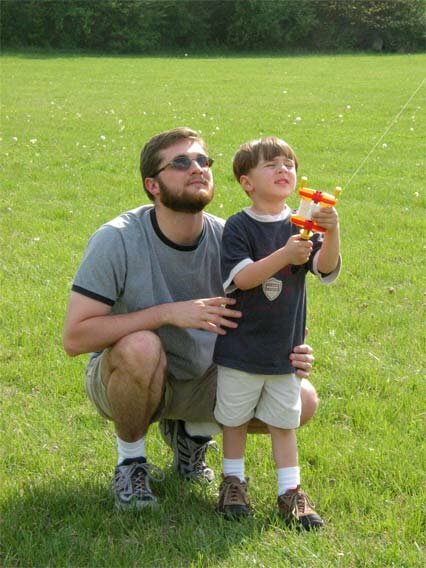 We finally got a chance to go out and fly a kite yesterday for the first time with Conner. First time for Zach too, for that matter. Conner and Anita picked the kite up weekend and he's been asking every day since to go fly it. When we got to the park there didn't appear to be any wind at all. 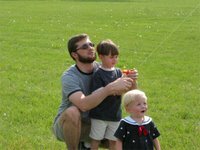 As we parked, Anita and I took the time to explain to Conner about how it takes wind to make the kite fly. Then, making the connection to the fact that it wasn't a very windy day, we tried to make him realize that if it didn't work, it was just because there wasn't enough wind today and that we'd have to come back and try again on another day. Well, all of that was moot. Conner and I walked out in the field, a gust came by, I let go of the kite, let out a little string, and *zoom* we were flying. Easy as that. Figures. I didn't have to run or anything .... to get it going. I did have to run a little later to keep it aloft as the wind shifted and we got too much slack in the line. It was a fun day and Conner really enjoyed it. I'm going to have to find a better reel though because this one was really hard to work with and Conner couldn't hold it very well without the string pulling out on him. At one point the wind was moving it around a whole lot and Conner said, "It's dancing on me" in a completely serious tone since he had heard me using this phrase earlier to describe the way it was behaving as the wind started to shake it around quite a bit. I thought it was just hilarious that he used it not 5 minutes later. 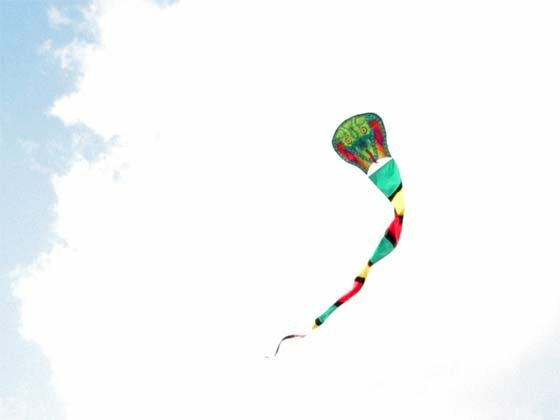 The kite is a Cobra by the way, in case you can't make it out. Anita said that there is a dragon version that she wanted to get, but they didn't have any more of them. I was bummed... I'd have enjoyed a dragon a lot more :).